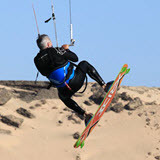 Bay Area Kiteboarding • View topic - Travel to Miami Beach for Foiling - Some Advises ? Travel to Miami Beach for Foiling - Some Advises ? I am about to travel to Miami and I am looking for tips to foil over there. Did anyone traveled there recently and could give me some recommendation/advises ? BTW: As I was googling I saw there was a ban for kiteboarding at Miami Beach ? Re: Travel to Miami Beach for Foiling - Some Advises ? If you go up to 86th street, there is a small hut for a school, and a few kiters there who can help with tips. Near shore, you can only ride between a buoy and the lifeguard station, but once you're out a ways you could ride down to southbeach. There is one other place you are allowed to launch from, which I think is around 29th street. It has a little more foot traffic to deal with as it's along the hotel stretch. I got stung by jellyfish parts (up my shorts yay!). A shorty or 1-2mil top is plenty of warmth. Sun may be more of an issue, so bring a rashguard at least. Also, try to get an IKO card just in case. Officially you're supposed to have one and some streamer attached to your harness. I managed to ride without one and didn't get hassled, but if you go to Crandon they require it and also a day pass to ride there. And more rules about how many kites on the water etc. The ikite wind sensor that locals recommended is Crandon Light - Government Cut. Wind there is less dense, and you'll see some massive kites out, but for the foil you'll be stoked.